ABOUT US – WE SUPPLY THE SMILE IN FIRST AID!! Shelley Meredith formed Complete First Aid Supplies Ltd in 2000. Shelley is a certified First Aid Training Instructor which, coupled with her comprehensive background in nursing, St John’s, first aid training, and first aid supplies, gives a depth of experience and product knowledge in the area of first aid kit and first aid supplies that is second to none. Complete First Aid Supplies began in the front room of Shelley’s Auckland home. Visiting businesses personally, she quickly built a loyal clientele. Shelley pioneered the concept of going beyond supplying a simple first aid kit to clients – she visited clients to assess their needs and to ensure they met OSH(now WorkSafe NZ) workplace first aid regulations. She then followed up with regular visits to clients ensuring their kits remained complete and up to date. With superior service, good pricing, and expertise, Complete First Aid Supplies outgrew Shelley’s front room a long time ago. The company is now housed in a New Lynn warehouse. Shelley stills manages the company and ensures staff are fully trained and motivated but there is now a network of sales and restocking agents. With service that is as professional and as competent as ever, Complete First Aid Supplies now operates nationally. Our Goal - "Meeting your first aid needs"
and by going the extra mile to ensure our clients’ needs are met. At Complete First Aid Supplies Ltd we believe that to be successful we need to be dynamic in all facets of our business. We’ve proven this to our clients by offering them the greatest variety of choices and broadest range of products and services available within the New Zealand first aid market. At Complete First Aid Supplies, our customers are always first. 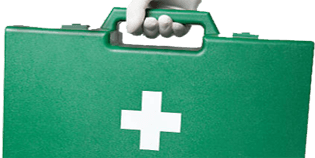 At Complete First Aid Supplies a rewarding working day is when we know we have helped people and businesses with their first aid supply requirements. Naturally, we hope that none of our clients experience serious injury within their workplace, but if they do, we want to make sure that the first aid kit we’ve supplied has everything in it to cater for that emergency first aid need. For a free, no obligation, consultation of your first aid needs, and to bring your business up to current WorkSafe NZ first aid safety requirements – contact Complete First Aid Supplies Ltd today.